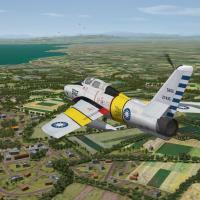 This mod is NOT released under the Combat Ace Freeware Licensing Agreement (http://combatace.com/topic/55729-freeware-licensing/) as it includes content NOT subjected to it. For all the rest you MUST contact the original author beforehand. To my knowledge you only need SF2:E, however you might also need the Exp2, if you have finflashes not showing, just tell me and I'll include mine rather than using TW's. This should work without trouble with NATO Fighters 5 (however the versions already included in NF5 have a slightly different file organization and naming convention). This mod should not rewrite anything except itself and the relevant campaign files. All planes marked with a * in the numbers list are considered historically correct, all others are as correct as sources allow, at worst they come from the pool of planes available to the nation in the given timeframe and bear possibly existing squadron numbers. 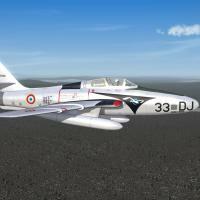 There's a topic on CA (http://combatace.com/topic/68436-rf-84f-thunderflash-request-for-information-and-superpack-wip/) tracking my progress and meant to receive any feedback and information you might want to share. The Suez and Norwegian skins are bonuses and not useful for a Europe '56 campaign. I initially planned of including slightly anachronistic camouflage versions for Belgium and Netherlands, however, given the time needed for the operation and the fact that the campaign takes place in the heart of winter, camouflage would have made no sense. If you feel the need to properly install the Squadrons, you should add the following to your SQUADRONLIST.INI (if they squadrons are not already there), but everything is set up to work without it. All serial numbers involved in Suez are correct, 8 squadron numbers are attributed to the proper plane, 3 were used at Akrotiri but randomly assigned, the rest are randomly chosen from the most probable squadron numbers at the time. French RF-84F in late 1956 would have been stationned at Cognac, but would probably have been detached in Alsace or Germany in case of conflict, one squadron relieving the previous, given the involvement in Operation 700 and the readiness of the squadrons in late 1956, the order of detachement would have been ER 2/33 first then ER 3/33 and finally ER 1/33 (remember, the last planes reached France from Cyprus in late December, and the last ground personnel and equipment in early January 1957, so even accounting for a rushed move, the attrition of planes and personnel would mean they'd probably take no part in the conflict unless it lasted into the Spring of 1957). 3 or 4 stripes of different colors denote a plane assigned to the Wing Commander, 2 stripes or the same color to the Squadron Leader and 1 stripe to a Flight Leader. These planes are meant to use specific pilots however this is strictly optional, if you don't add them, the game will use the default pilot, so it's only a matter of adding more pilot variety and a more authentic feel to things. To respect the LOD author's wish not to have a situation where his work might be unknowingly used without proper attribution or worse you'll have to download the pilots separately or as part of the packs in which they are bundled. 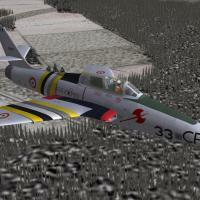 All are based on Old Diego's pilot, with skins by Corktip14 for the French version, ravenclaw_007 for the German ones. 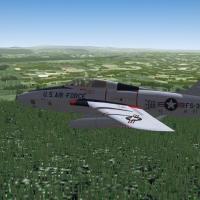 The necessary campaign files have been modified to add the Taiwanese RF-84F, just overwrite the original files. Due to JonathanRL's way of implementing squadrons (without a proper squadron list) I've had to use a specific variant for Taiwan rather than use it as a skin for the US variant, as should be. It also means that unless you add the squadrons properly, the ROCAF 4th CRS will appear show up as a USAF unit (without impact on anything else than text displayed on the loadout screen). It was the best compromise to be both working with Formosa Freedom and still be compatible with the standard implementation. At the moment I'm not interested in providing a package solely for that purpose. 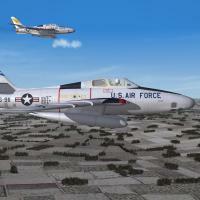 The necessary campaign files have been modified to use the updated RF-84F, just overwrite the original files. Be aware that it will leave the RF-84F using my old naming convention in place, it's up to you to delete it if it creates confusion in single mission play. - The spoilers are not part of the model and are only painted on. - The brake chute fairing is there even on early models. - Some skins are not "right" due to subtle mapping problems and a model not 100% accurate. 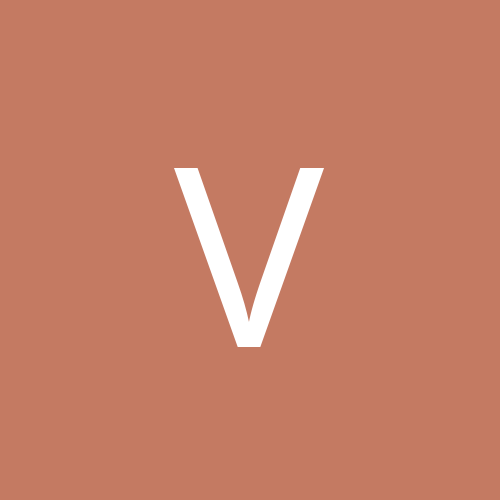 - Some parts inherit the global skin lighting values instead of having these set to fixed values. - There may be some decal bleeding on lower visual settings as in some cases I only leave a 1 pixel margin. A huge thanks to all the modders allowing me to bundle their work with my skins or taking the time to explain why they'd rather not, to eburger68 for his work on NATO Fighters motivating me to get back to work and of course to CA and TK for a wonderful toy and the community to go with it.